A book is to read. 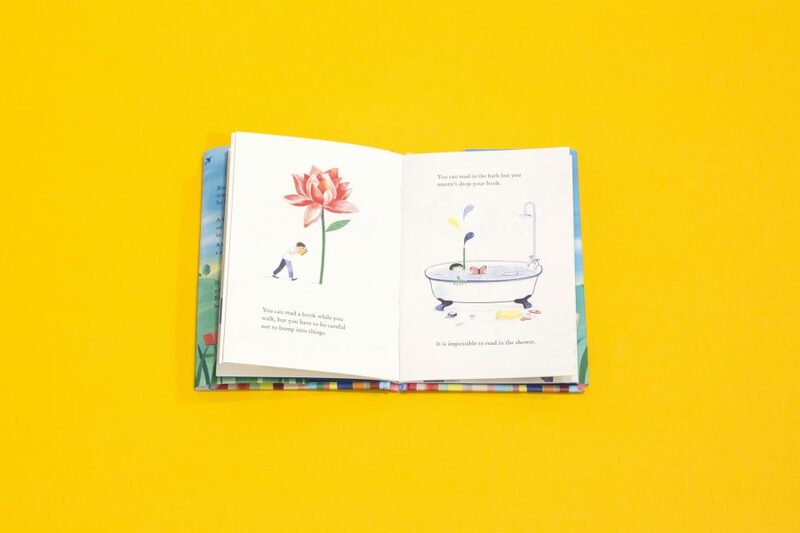 This book asks ‘what is a book?’ It celebrates books and reading. Although ‘told’ from a child’s view, it captures the value and magic of books felt by all voracious readers, and is a perfect gift for book-lovers of all ages. If it’s Sunday and raining, a book is the perfect thing. Even a small book, because boredom can be very big. 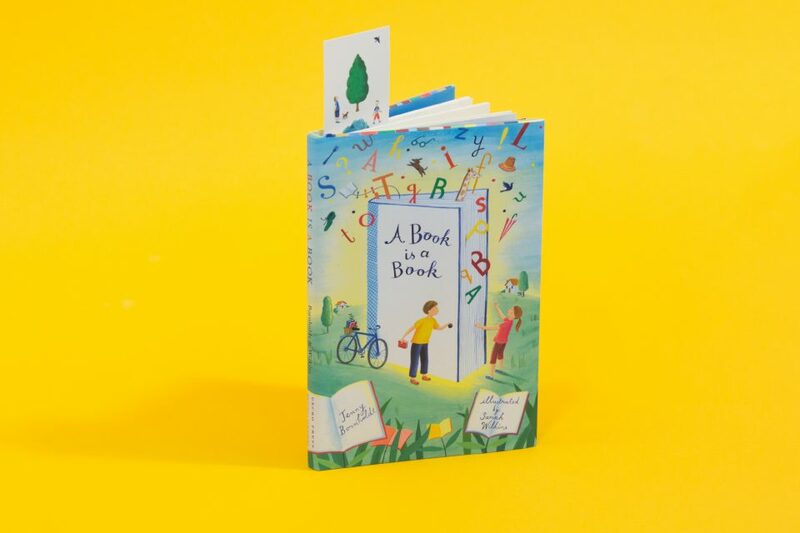 The perfect book definition in miniature for young readers, with spare, evocative prose that appeals to a youthful sense of humor … It perfectly portrays the ability of books to open worlds to readers, no matter how young. A perfect gift for bibliophiles of all ages … it should stick in readers heads and hearts for a good long while. It is a book to read aloud, with others, and to reflect and talk about the content, and memories evoked by the written content and which the small, but clear pictures. For families where reading is valued and enjoyed. The story will charm bibliophiles … This tiny tome will make an excellent gift for the book lovers and librarians in your life and might make a good marketing tool for the other books in your library. Ideal for the home and the school library … Lovely presentation for everyone. Perfect for a child on a lap or as a stocking stuffer for older bibliophiles. 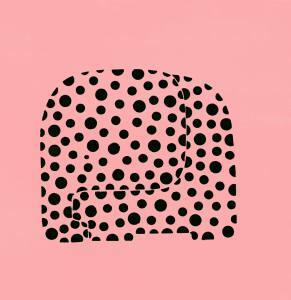 the illustrations are delicate little things full of colour and detail. 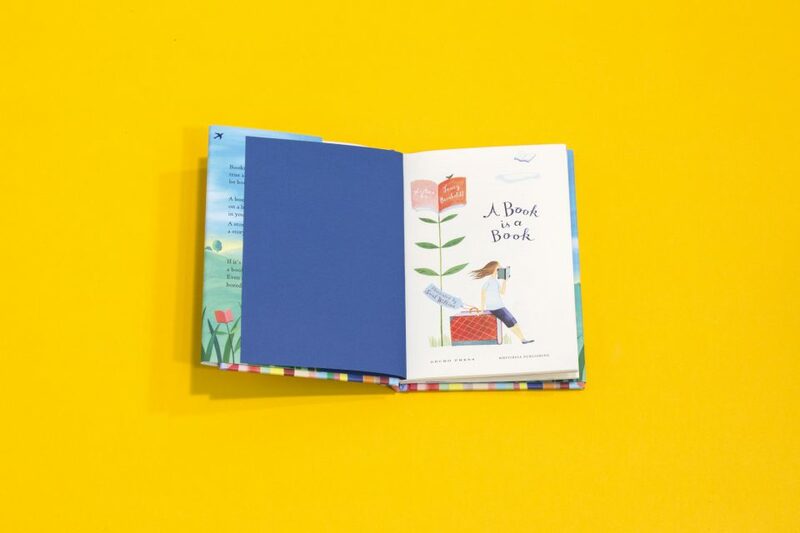 They hold a poetic charm that gives this book a quiet, magical quality … For both adult and child alike, ‘A Book is a Book’ serves as a little reminder as to why books mean so much to so many. There are just a few lines of text per page but they are so perfect … expounded in the whimsical painted illustrations. This is truly a book for book lovers of all ages to enjoy and it is guaranteed to bring a smile to your face. in a quirky and colourful style. Altogether this book is a joy. 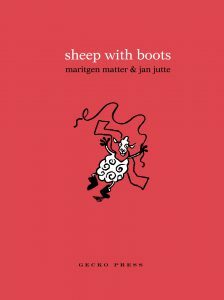 This deceptively simple book is a springboard… Jenny Bornholdt, a major New Zealand poet, knows the magic quality of words and reading, so each of her sayings is an invitation to the imagination… Walt Whitman would have loved it. 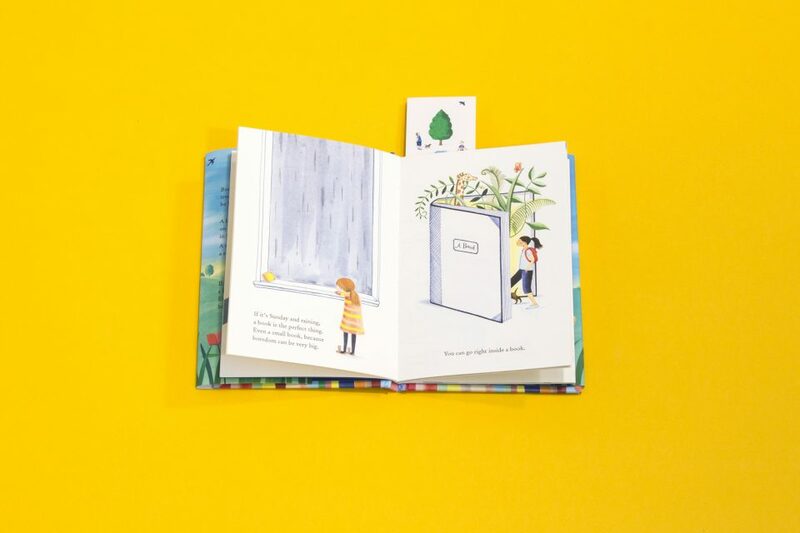 If you want a tiny little treasure pocket-sized book you can carry around with you, to whip out the next time someone asks you [What’s so great about children’s picture books?] then A Book is a Book is utterly perfect. Beyond the words, the illustrations are great … if you doubt that you can read images, try these. … the creators [show] how expertly books can animate our lives. They animate these pages too, with simple writing, warm touches and more. A riotously colourful piece of imagination for children. A small and perfectly formed hardback…with writer and acclaimed poet Jenny Bornhodt’s humorous meandering charm … Award-winning illustrator Sarah Wilkins’ beautiful, delicate and whimsical illustrations printed on lovely cream paper enhance the overall experience. Mainly for children, but this adult found it delightful. A Book is a Book will be enjoyed by adults and children, especially book-lovers who will appreciate the very wise, kooky and thorough explanation, exploration and celebration of what, precisely, a book is … The pair clearly share a delightful sensibility and a deep abiding love for books. A very special book … The look and feel of a precious work of art … The design standards are breathtakingly good. Beautiful to hold and look at, and full of lovely sentences about books and reading – what more could an editor want? Plus my six-year-old loved it and has claimed it for her own. A honey … a whimsically philosophical tribute… The production’s gorgeous… It’s a keepsake for the future. That rare thing: a hardback book with a dust jacket… In a couple of hundred words and just 40 pages, poet Jenny Bornholdt packs in a wealth of wisdom about books and why we can’t do without them. A quirky collection of musings about books and their capacity to entertain, intrigue, captivate, educate or simply stave off boredom… ‘Some books are small because some writers are very tired’ obviously does not apply in this instance. 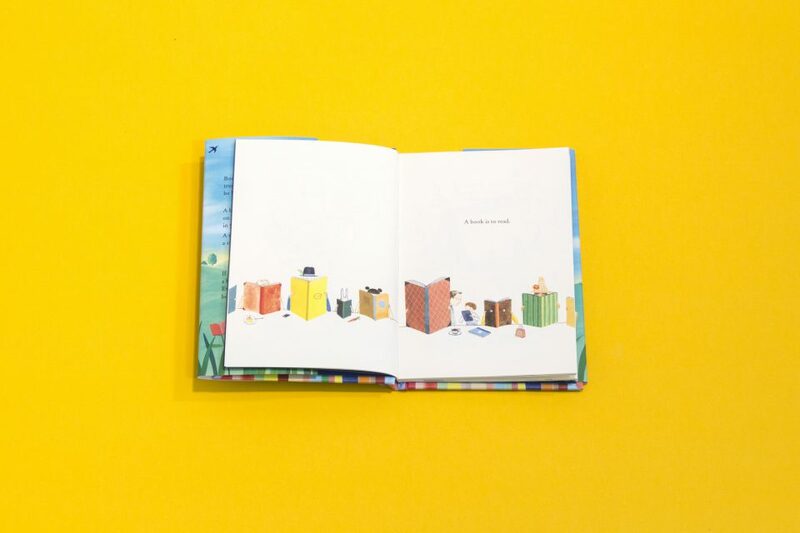 Jenny Bornholdt has recaptured her childhood delight in reading with her first children’s book… And what was the answer to the question: ‘What is a book ?’ A Book is a Book, of course. When you have seen A Book is a Book you will be unable to resist buying it for someone (and then for someone else, and then for yourself)… This delightful book is full of whimsical observations on books and their place in our inner and outer lives. You can practically feel the love that has gone into the creation – from the writer to the artist to the publishing choices. A Book is a Book shines in all areas. Written by top NZ poet Jenny Bornholdt, this beautifully illustrated hardback is a celebration of books and reading. It’s the perfect gift for book-lovers of all ages. 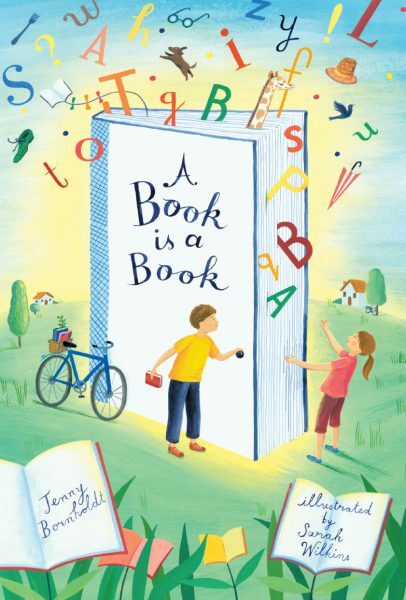 Jenny Bornholdt indulges in a delightful rumination on the power and attraction of books and reading in her first book for children. She uses straightforward, childlike statements spiced up with flights of fancy to good effect – and it’s the right sort of mix to draw kids into the wonderful world of books, and maybe get them thinking about reading a little more. Each page is sweetly illustrated by Sarah Wilkins, capturing the magic that is a book. Combined with the whimsical, amusing text, this would make the perfect gift for a child or adult who often finds themselves lost in the pages of a story. This book exists to do very wonderful things: promote reading, libraries, the sharing of stories – the sharing of a love of reading and books. It’s a beautifully told tale… A wonderful gift to give to yourself (let alone anyone else) – [it] does its best to convey the magic of getting lost inside a good book. This is simply a delight to look at, to hold and to read…both a profound and simple book. An absolute must for all those who love books. A perfectly-formed tribute to a real book … Readers young, and not-so-young, will smile while reading this compact treasure. As we go through this 37 page beauty the poetic text describes the various attractions of a book none better than ‘a story belongs wherever a story belongs’ … Lovely presentation for everyone. Each page of this book is unexpected, as I read and re-read it I fall in love with new pages … This book deserves to be treasured by generations to come … A perfect gift for booklovers of all ages. I’m both an early childhood teacher and a booklover. I came across this book at Bowen Gallery’s exhibition of Sarah Wilkins’ illustrations which are just so beautiful. Imagine my delight when I discovered they all belonged in a book. Jenny Bornholdt’s words are the ideal companion and perfect for reading aloud. I am really looking forward to taking the book to work and sharing it with the children there, but first I read it out to my teenage sons and my husband – all bookworms. They laughed out loud at some of the lines 🙂 You MUST read the dedication, all of it. And take off the dust jacket too, for a peek underneath… My one quibble is that it is a very small book, and so reading it to a group may prove a challenge. 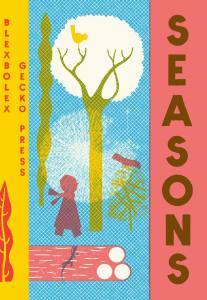 But overall, a thing of joy, and highly recommended for booklovers everywhere – a perfect Christmas present!